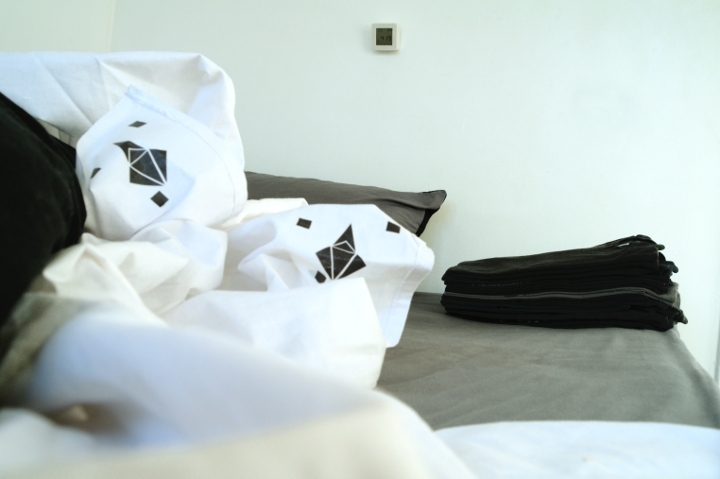 [Image: Optically tagged "robot-friendly bed sheets" from With Robots by Diego Trujillo-Pisanty]. Rather than build entire forms of architecture, however, Diego suggests that we'll first begin quite simply: retrofitting our interior environments, in often deceptively small ways, for optical navigation by autonomous mobile home systems. 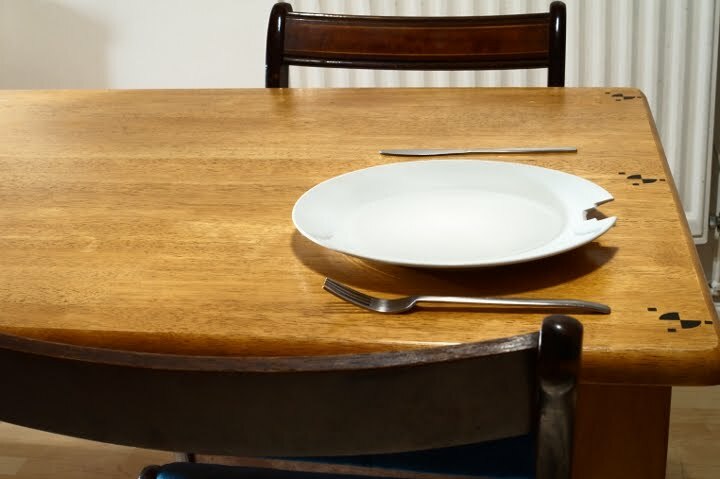 This will primarily take the form of peripheral additions to everyday objects, as well as a new range of optical tags that will allow certain tasks—folding blankets, for instance, or setting the dinner table—to be accomplished much easier by machines. "Every living space is different," the project description explains, "not only in the architectural layout, but also in the tasks that the tenants require robots to do. For this reason, robots ship only partially programmed so that through a learning algorithm they might adapt to the home they operate in. To accelerate the learning process, special learning tools have been designed to help the robot integrate to a 3D environment." 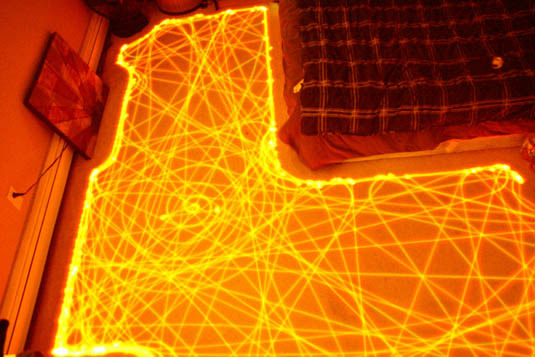 The photograph seen below "shows a living room after a robot self-training session. 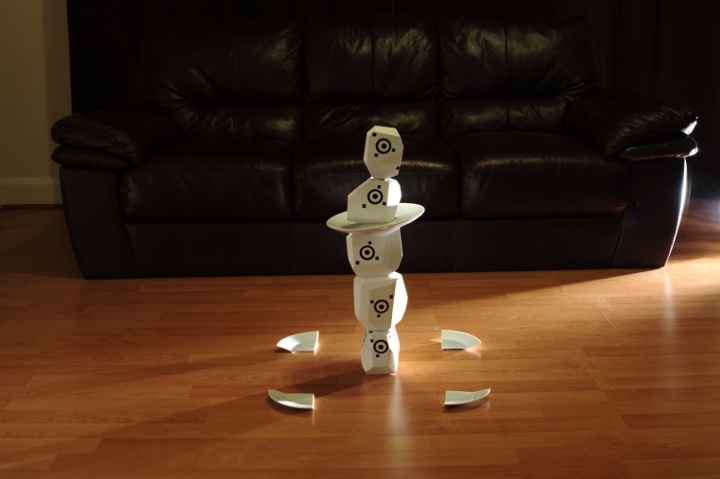 We can see it has now mastered the physics of equilibrium. It is also evident that it has mistaken one of the house's dinner plates which it has broken with robotic precision to complete its piece." 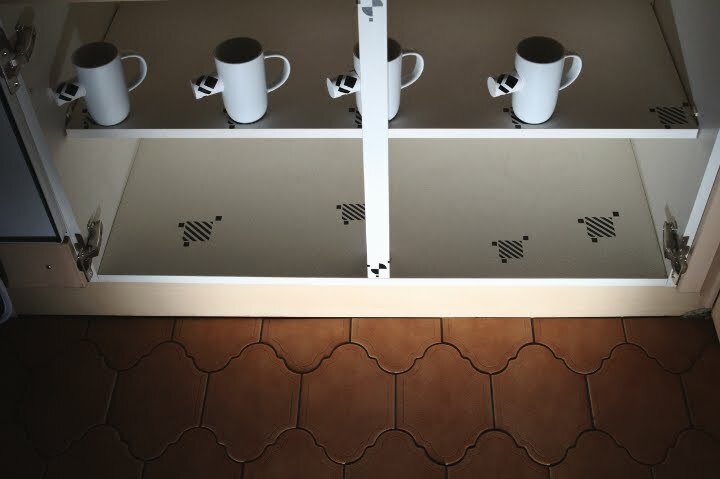 "Robot-friendly" handles will also be added to coffee mugs, the project suggests—which then ripples outward, effecting other spatial dimensions of the domestic environment, including where those mugs are stored. Thus, we read, "the cupboards in which these cups rest have also been altered in order to accommodate the robot. Not only are there tags marking the position of objects, but the doors have also been removed as they were not fit for A.I." Cooking itself will also be altered; the next image seen here "shows how meat has been precisely cut into cubes without leaving any cut marks on the chopping board. The board itself has notches to facilitate robot interaction. In the background the meat package can be seen; it too has been labelled to suggest that the robots operate beyond a single house." In fact, it is not difficult to imagine, as both Diego Trujillo-Pisanty's and Kevin Slavin's work suggest, a world in which everyday furniture has been subtly redesigned in order to fit the Roomba's spiraling subroutines—and not the other way around—or even whole rooms peppered with strange, ankle-high optical tags on certain walls, doors, or objects, used to steer the Roomba this way or that at specific points in its room-cleaning operations. Like a tomb from Egypt's Valley of the Kings, our houses will be covered in hieroglyphs—machine-hieroglyphs, not legible as much as they are optically recognizable. The usal scientific approach is to try to hide such "markers", but I really think that this approach where you can see the twist, the mix between an environment dedicated to humans and a one dedicated to robot is much more interesting. It reminds me also a little bit of the project we led back in 2005-7, Variable_environment/, where we created a full interior environment and cloths made out of AR tags, webcameras objects and codes for small robots.